Maybe it’s not only for voters in the 17th Congressional District suffering from having their personal information stolen online? 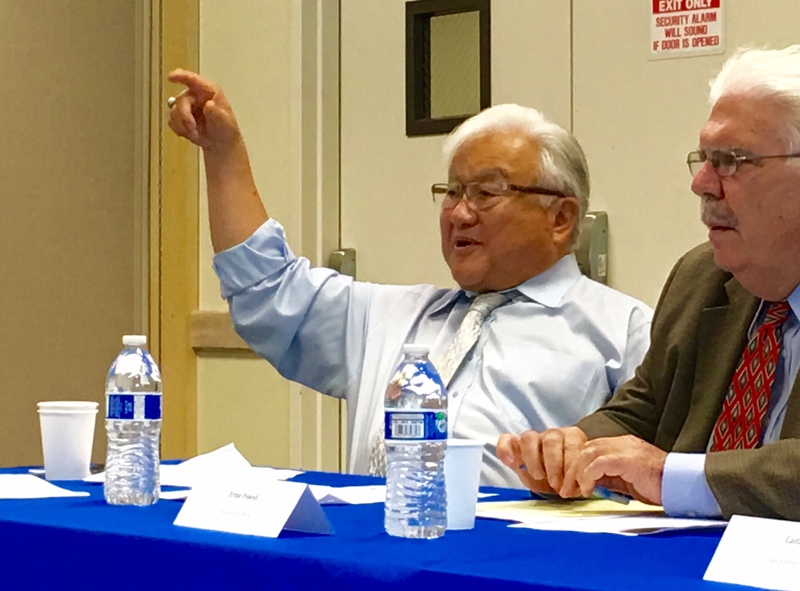 Maybe it’s also for Rep. Mike Honda, himself? Honda’s congressional office is holding a cybersecurity town hall Monday, Oct. 17, in Santa Clara. The event also includes speakers from the F.B.I., Department of Homeland Security and the U.S. Secret Service. The event is highly topic in the 17th District’s bitter electoral rematch this November between Honda and Ro Khanna. And maybe purposefully so. Last month, Honda’s campaign filed a lawsuit in federal court alleging his campaign’s donor data suffered a “cyber attack” at the hands of challenger Ro Khanna’s campaign. “Nearly every week there are reports about another company or government computer system that has been hacked, with thousands of people’s personal data compromised,” according to the description of the event being held at the Santa Clara City Council chambers. According to the lawsuit, Khanna’s campaign manager Brian Parvizshahi, who has since resigned, continually accessed Honda’s donor data for nearly three years. Parvizshahi was once a summer intern for the fundraising consultant used by Honda. Meanwhile, lawyers for Honda and Khanna met in U.S. District Court Tuesday. Khanna agreed to allow Honda’s attorneys to peruse its own donor data in order to discern whether any information belonging to Honda has been used. Khanna has denied ever having access to the information alleged by Honda’s campaign of being stolen. The next step in the congressional race’s courtroom drama arrives Oct. 31 when Parvizshahi and Khanna are due to submit their responses to the charges. Most likely, the case will continue well after the Nov. 8 election. Posted in 2016 Election, Brian Parvizshahi, CA17, congress, cyber attack, cybersecurity, FBI, Mike Honda, Ro Khanna, Santa Clara, town hall, US Distict Court. Bookmark the permalink. Rather than stealing a politician's data, somebody should just steal the politician. Of course anyone who stole a politician and held him for ransom would probably find that most of use would not be willing to pay even one penny to get the politician back. To get a quick summary and review of the amusing story “THE RANSOM OF RED CHIEF,” go to Wikipedia and type in the title. In fact related to the actions of the ten year old child who was kidnapped, but then irritated his kidnappers so extremely much that the kidnappers then agreed to pay his father to take the child back, if you ever ever commit the “crime” of telling the truth on a subject that is embarrassing to a large, wealthy, and powerful organization, and then in retaliation that organization harasses you by having you kidnapped by an organized crime ring that pretends to be a law firm (organized crime rings that pretend to be law firms get away with kidnapping whistleblowers by pretending those kidnapping sessions are supposedly deposition and discovery), just start passing out flyers referring to the facts that lawyers have far and away the highest rates of alcoholism and drug addiction of any major profession. Pass those flyers out near: one the office of that sleazy organized crime ring that pretends to be a law firm; and two, the California State Bar, and which has its main office in San Francisco, and very close to the center of downtown. Also mention in your flyers that the totally corrupt CSB, and which pretends that its two primary functions supposedly are: one, monitoring and regulating California's lawyers; and two, protecting the general public from lawyers who are crooked and/or incompetent – is actually one of the very phoniest, sleaziest and most corrupt organizations of all time, also has a secret system of two sets of books, and also sells pardons and coverups for lightly disguised bribes that it pretends are fees for courses. Yesterday while reading some of the items on a website that supposedly were jokes about lawyers, although actually I think at least most of those items were true stories and NOT jokes, the item came up of the witness who was instructed to “TELL THE TRUTH, THE WHOLE TRUTH, AND NOTHING BUT THE TRUTH,” and who then commented that everytime he tried to the lawyers interrupted him. And then about twenty years ago I read an article by a guy who said that earlier that day, and before coming to work, he had had been a witness at a deposition at which various lawyers were present, and including lawyers from the San Francisco DA's office. The reason he was there and was being questioned at that deposition was that he had been a witness to a fight. He said that everytime one of the lawyers asked him a question, another lawyer would object to the format of the first question, and then of course a third lawyer, and then a fourth lawyer, etc, would all start interrupting each other, so in other words any question that could have been fully, properly, and completely answered in one minute or less could not be answered even in a few hours with the “help” and “assistance” of the lawyers lies, garbage, and nonsense. And then that lawyer from the DA's office followed by telling him that if they wanted to use something they would, and if they did not want to use it they would not. In fact, it sounds just like the attitudes of the lawyers in Alameda County's DA's office and County Counsel's office. So therefore anytime you see one of sleazy slithering snakes with a law license who “knows” that since he is lawyer he is an extremely “superior” person, get down on your hands and knees and knees and kiss his feet.